The Ripple – She’s Finished! You might remember when I started another project – a wonderful, rainbow-colored afghan – at the beginning of the year. This time, it was a ripple. 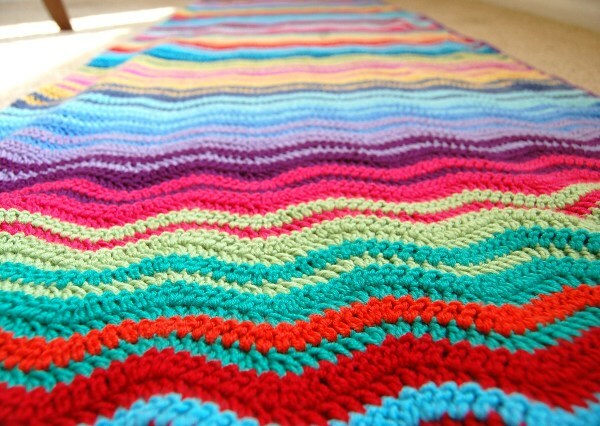 Based off Attic 24’s crochet ripple blanket pattern, this blanket was to be comprised of over 17 different colors. 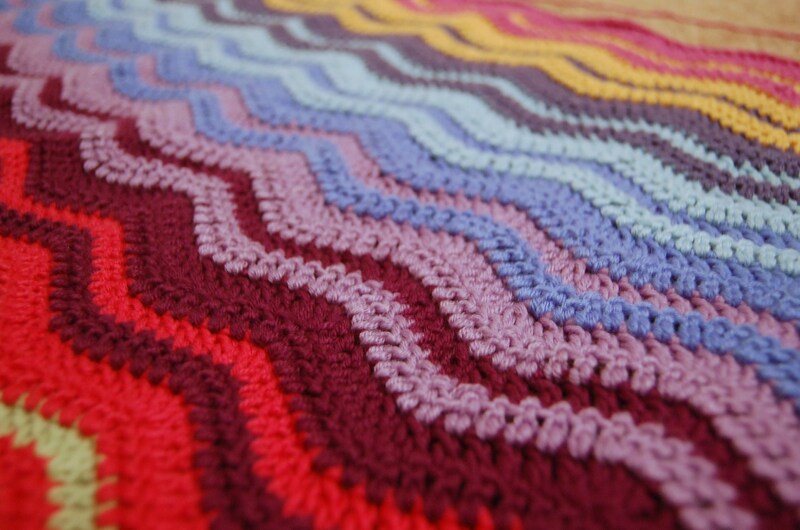 I watched as the blanket grew weekly–during late night crochet sessions, a movie, a phone call with a friend, or while watching some episodes of Arrested Development. A pink ripple here, a purple ripple there. And now some orange. Stop. Look at the colors. What’s missing? Ooh… maybe some cobalt blue to make the colors pop. The ripple is larger than the hexagon afghan I crocheted last year and when she’s spread out, she takes up quite some space. As usual, I took way too many pictures of the finished product, but the colors make it hard not to enjoy. 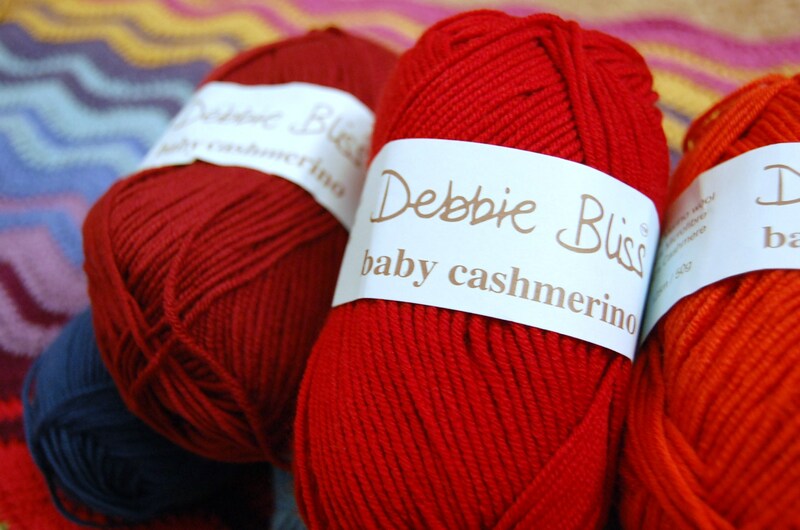 I hope you, blog reader–even though you can’t touch the ripple, can’t feel how soft the baby cashmerino yarn makes her waves–can enjoy her, too through my humble pictures. This blanket is ready to go to its new home where I know it will bring happiness and warmth. It’s been a real treat finishing her the past couple months and I know she’ll be in good hands. Hope you enjoyed! 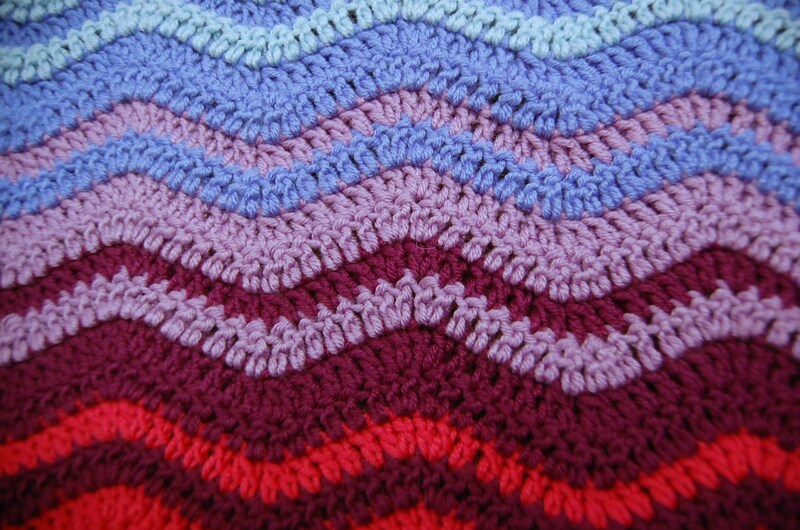 I can’t believe I’ve only posted about the crochet ripple blanket ONCE since I began. I’m ashamed, really. 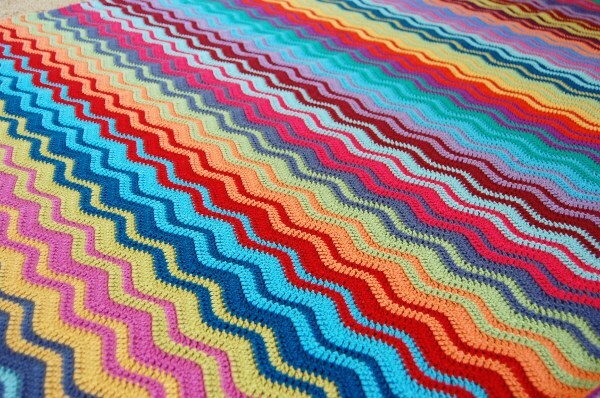 Currently, there are 29 colored stripes (116 rows) of this beautiful rainbow afghan. 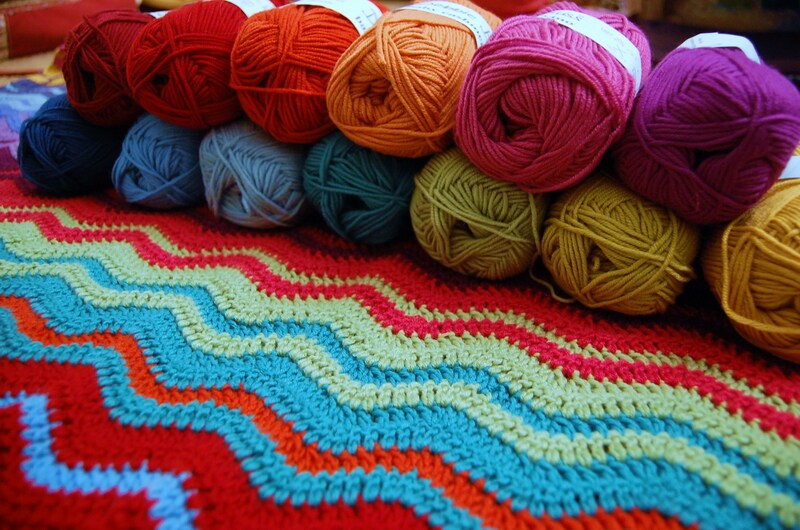 Just like any large crochet project, I’ve noticed ebbs and flows in my desire to work on it. Some months, it’s 20 rows, other times, it’s 2. But that’s all part of crocheting. 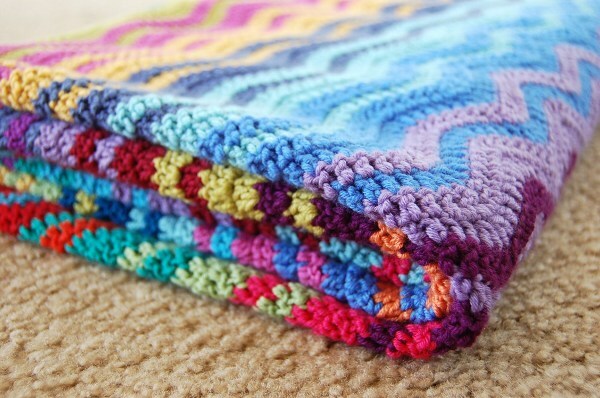 I”ve already covered the details behind this blanket so I won’t bore you with more text. Onto pictures! If, after viewing these pictures, you don’t want it to instantly be summer, there is something wrong with you. Please seek help. Happy Monday, everyone! 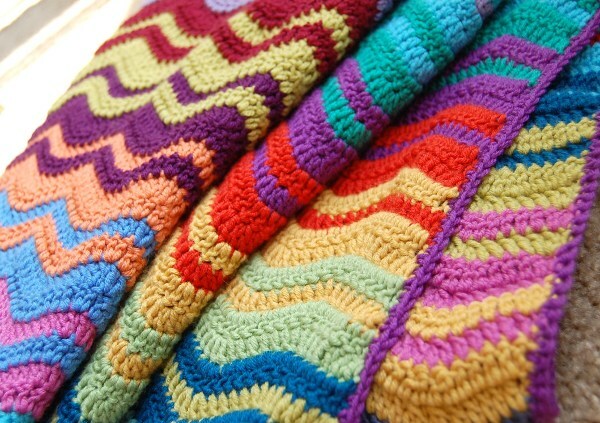 New Year – New Afghan! With the advent of a new year comes a new treat! 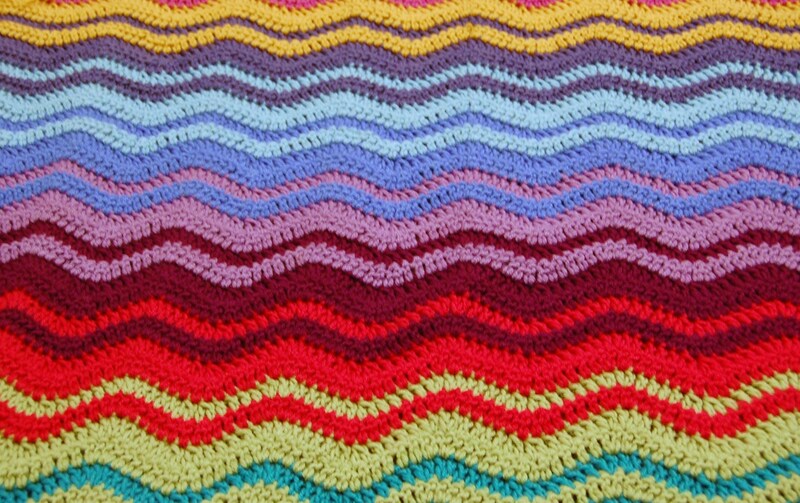 A few days before Christmas, I was commissioned to make a new afghan – this time a ripple. This blanket was ordered by the same wonderful lady who ordered the crochet hexagon blanket a couple months ago. Remember that beauty – it’s probably the nicest thing I’ve ever crocheted. Up until I crocheted “hexy“, I wasn’t much of an afghan crocheter. I used to tend towards quick, instant-gratification projects. A number of you have called me out on my new-found affinity for afghans, and I must agree. I seem to be an afghan convert! 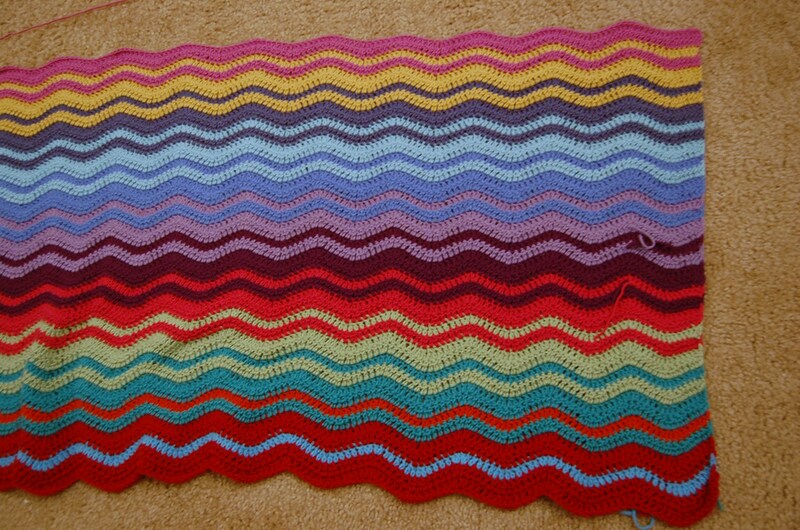 So now to introduce my new project for the first part of 2011: The Crocheted Ripple Afghan, inspired by Attic 24’s lovely ripple blanket. The yarn for this afghan arrived the day I was leaving for Christmas so I was able to have it over the little break I had. Let me tell you, friend, there was lots of crocheting over the holidays! 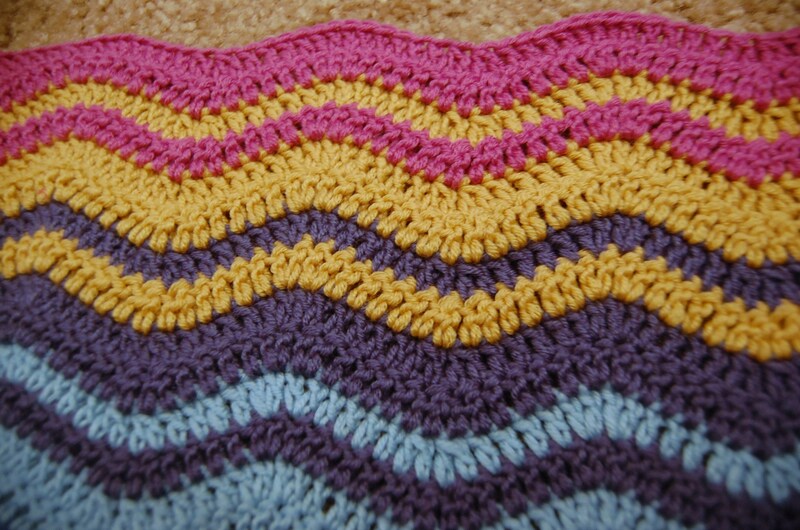 This pattern is so relaxing, so simple, so theraputic and the colors – oh the colors. The way they blend together and flow so perfectly. It’s quite the treat. I’m excited to work on this project throughout the winter (especially since they’re calling for 8 inches of snow tomorrow) and am excited to blog about my progress. 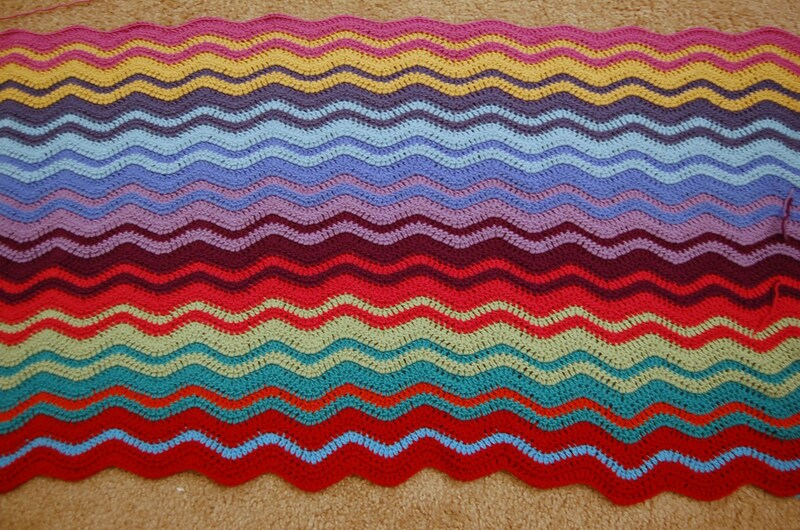 I guarantee there will be an over-abundance of pictures, so much so that you’ll probably be sick of ripples by the time the afghan’s finished. I apologize in advance. So far, I’m 45 rows into the afghan. Wow – that sounds like a lot. I promise I spent time with my family and did more than crochet over Christmas! 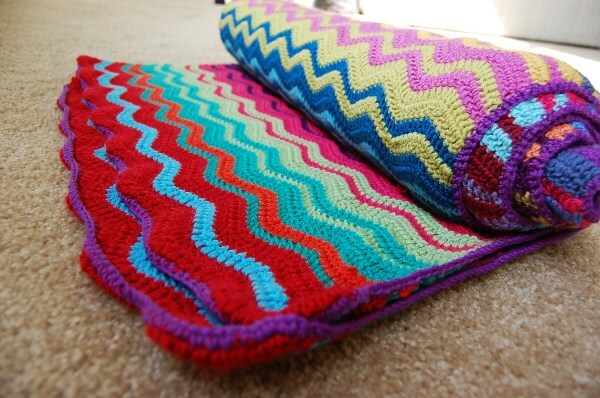 I’d like to come up with a creative name for this blanket – something more original than “the ripple afghan”. Anyone have a suggestion? But Happy New Year to you, dear friend- Here’s to a great, ripple-filled 2012!